It is a high-impact, aerobic form of dance done to live music by teams (or sides) of four or six who are all dressed in brightly colored kit. The stepping is done in a style designed to maximize the ringing of the bells whilst minimizing the danger of impact injury. Some dances consist of 6 solid minutes of stepping and are more strenuous than running for a mile. 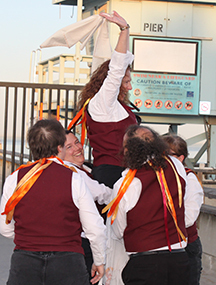 Dances done while waving handkerchiefs often contain spectacular leaps high into the air. Dances done with clashing of sticks could have nasty consequences to dancers or audience. "The Morris is not an easy dance...It is not everyone's dance, nor has it ever been so regarded by traditional dancers." The term "Morris" has been applied very broadly through history. It could be said to encompass almost any form of traditional English performance done on the street. The Cotswold Morris is typically well-rehearsed dances done in the spring. Morris by itself most commonly refers to Cotswold Morris. Mumming is a theatrical performance of exaggerated characters typically done near Christmas. Welsh Border Morris is a wild, usually stick-wielding dance often done with blackened or painted faces and in the winter. In Longsword dances the performers link themselves by holding stiff swords. Rapper sword dances use extremely flexible swords with swivel handles for very tight intricate patterns of motion. Carnival Morris consists of pompom-wielding women marching along the street performing drill-team-like precision figures. Other forms include: Northwest, Clog, and Molly dancing. 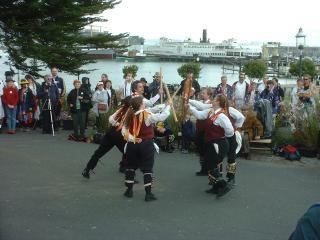 Curiously enough, most inhabitants of any one region of England have never seen and do not recognize forms of Morris dancing from other areas.